EMPIRE Slovak Open after 4 years of waiting knows again winner from Slovakia. 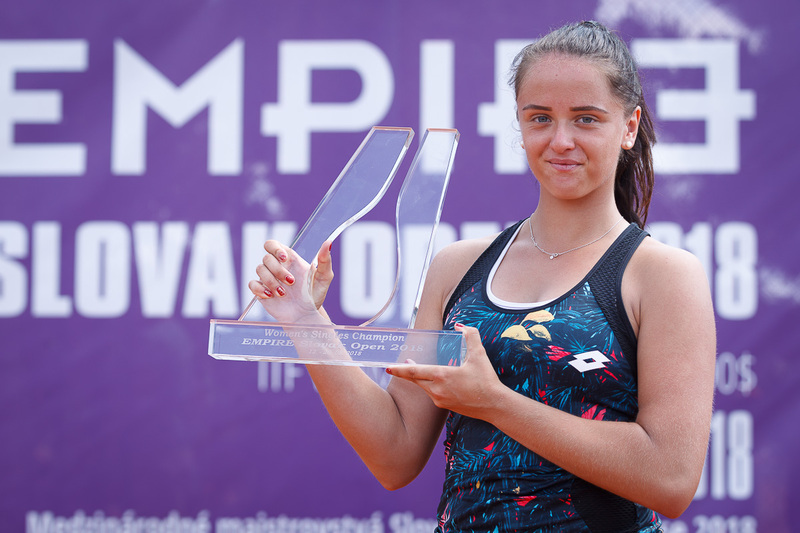 The biggest clay court event in Slovakia, its 10th edition, was dominated by 20 years old Viktoria Kuzmova, who overwhelmed in the finals Veronica Cepede-Royg of Paraguay in 3 sets 6:4, 1:6 and 6:1. It is the most valuable title of her career so far. Kuzmova has equaled Anna K. Schmiedlova who triumphed in Trnava 4 years ago. At that time, tournament was funded by 75,000 $, is now funded 100,000 $. "It is really huge success for me to win such a big tournament and even played on clay," said Kuzmova, whose opponent failed to win for a second time. Last year she lost to Czech Vondrousova. "My opponent did not make mistakes during the whole match. I made some unforced errors in the second set. I got cramps, I tried to play faster and it didn’t work at all. It all started again in the 4th game of the final set, I played some winners, which helped me a lot. I did not think of feeling unwell I just went for it. I am very pleased to win following Schmiedlova as the second Slovak player," Kuzmova continued. Kuzmova moves to number 84 in the WTA rankings thanks to 140 WTA points for a victory in Trnava. "It's great because I can avoid playing qualies, they are very difficult at some tournaments. It's good that I can play directly in the main draw," confirmed Kuzmova who also avoids Roland Garros qualification. She's already in the main draw. "I play in the Paris main draw for the first time. I am really looking forward to it. I think I am playing well now so I will try to enjoy it there and give my best effort. I leave for Paris on Thursday. I'm going to have a rest for two days now, and try to recover," added Kuzmova. Jessica Moore (AUS) and Galina Voskobojeva (KAZ) in the doubles finals defeated number 1 seeded combination Xenia Knoll (SUI), Anna Smith (GBR) in 3 sets 0:6, 6:3, 10:7.